The album Six Songs, as the name suggests, contains six songs by Noel Harrison, all of which were recorded during 2012 and released the following year. It was made with Exeter-based musician Phil Rossiter on backing vocals and guitar. His performance adds a depth to Noel's music not seen on his previous album, From the Sublime to the Ridiclious, where Noel performed solo. 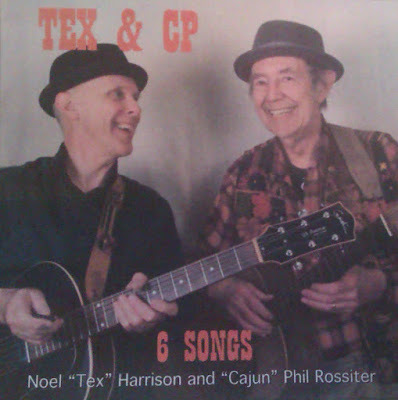 The record also has more of a country feel than Noel's previous work, leading to the name of the spoof country band, Tex & CP - with Noel's country music name, Tex Harrison, chosen as a reference to his father, Rex. All six tracks on the album are as good as anything Noel has recorded in the later part of his career, with stand-outs including the Ralph McTell song 'Moon, June and a Cajun Tune' and Roy Orbison's Blue Bayou. It also features a new recording of Noel's own 2010 track, 'Pre Alzheimers Old Timers' Old Time Song', which first featured on From the Sublime to the Ridiclious. Noel has always loved country music and Tex-Mex. finding someone as enthusiastic and talented as Phil to pick and grin with has been a great delight. We love playing this stuff and hope you enjoy it too. Phil has been singing and playing music since... well a long time ago! He currently plays guitar, mandolin, button accordion and a lot of other crazy stuff. Apart from having a good time with Noel Harrison, he also works with other bands including a gypsy and swing jazz group and K-Zee Zydeco Band - an Exeter based 6 piece zydeco and cajun music outfit playing creole music from Louisiana. Phil met Noel when K-Zee played for Noel's second wife's birthday party. Recognising a kindred spirit, he has had the great fortune to work with Noel a few years now. 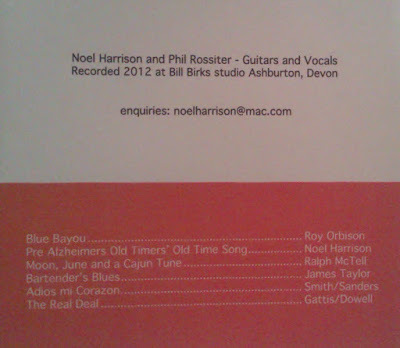 Phil played with Noel's band at the 2011 Glastonbury Festival. Watch Noel Harrison and Phil Rossiter perform The Windmills of Your Mind at the Barbican Theatre in Plymouth on April 13, 2012. This picture of Noel and Phil with their guitars was used as the cover photo for the album.